Run for the Arts Pledges Due Wednesday, October 28th! Run for the Arts Pledges are due Wednesday, October 28th. Use the coming week to collect pledges from your sponsors. If your sponsors write a check, have them make it out to “Young Audiences” or “Run for the Arts”. The Run for the Arts Prize Assembly will be Friday, November 20th. This year our goal is $20,000! 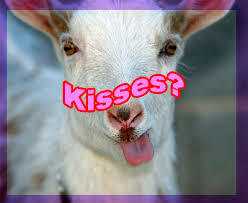 If we reach our goal, Anne and teachers will give big sloppy kisses to farm animals in front of the whole school! This entry was posted in Events, Fundraising and tagged pledges, prize assembly, run for the arts. Bookmark the permalink.